Jackie Nash with Jacob Bush in Allegro Brillante. Photo by Kim Kenney, courtesy of Atlanta Ballet. Ballet schools are back in session and dancers are preparing to be back in class with all of its exhilaration, magic, and, of course, struggle. Today, four dancers reveal what they found challenging as ballet students and how they now look at their technique as professionals. Teresa Reichlen in Swan Lake. Photo by Paul Kolnik, Courtesy NYCB. Jackie Nash with Moisés Martín in Atlanta Ballet's Bach to Broadway program. Photo by Kim Kenney, Courtesy Atlanta Ballet. Jack Thomas in Swan Lake. Photo by Arian Molina Soca, Courtesy Pennsylvania Ballet. Kayla Rowser in Swan Lake. Photo by Karyn Photography, Courtesy Nashville Ballet. Dancers are famously resourceful and particular when it comes to the products that they keep around to get them through the day. And we all know where those items live: the dance bag. While most dance bags are filled with basics like leotards, pointe shoes, Therabands and granola bars, we rounded up some of the quirkier items that dancers carry with them to provide comfort, inspiration and organization. These snippets come from longer stories on the contents of each ballerina's dance bag—click on each dancer's name for more. This National Ballet of Canada first soloist keeps a hand-carved wooden ballerina with her that her husband made in his high school woodworking class. After they married, Howard added her own little touch—a little rhinestone stuck onto the figurine's finger to mimic a ring. "They had to pick characters out of a book, and he chose the ballerina," she says. "It was so serendipitous! When I see this, I think about how that was years before we even met." Photo by Karyn Kipley for Pointe. Nashville Ballet dancer Kayla Rowser is one organized woman—her teal Lug bag is full of compartments. “That's why I love it," says Rowser. “I need a pocket for every little thing so that I can easily get to the bottom of my bag during five-minute breaks." Her sturdy duffel houses everything from a day planner to trail mix to her favorite MAC lipstick. Rowser also keeps a Moleskine journal to jot down corrections she receives throughout the day. “It's a good way for me to check in with notes I've received from previous rehearsals and to see places where I can take more risks." Rowser usually keeps a custom leotard by S-Curve Apparel & Design or Elevé Dancewear handy, too. “Both companies have been really wonderful about offering mesh that matches my skin tone," says Rowser, who also has her performance tights custom dyed. “I switched to tan tights two or three years ago," she says. “I remember seeing Houston Ballet's Lauren Anderson on the cover of Dance Magazine, and it was the first time I ever saw a dancer in tan tights." Anderson is still a source of inspiration for Rowser. “She wrote to me the first time I danced Sugar Plum to wish me good luck," she says, adding that she keeps a copy of that letter with her at all times. Rowser, rehearsing Swan Lake with Jon Upleger. Karyn Kipley Photography, Courtesy Nashville Ballet. From now until mid-October, Nashville Ballet's Kayla Rowser will be putting the final touches on her role of a lifetime. This month, she'll dance her first Odette/Odile in the company's Swan Lake (Oct. 17-19). In our bi-weekly newsletter, Pointe spoke with Rowser for about what it means to her, both as an artist and as an African American woman. You're sharing the role with fellow NB dancer Sadie Bo Harris. Has she given you any advice? So much of the choreography is with your arms up and your back bent in half, so she's helped me figure out where I can breathe to get through it. I've also been thinking about getting through all those fouettés in Act III. She told me, "Your body will let you do it. You just have to tell your mind you can." So much of it is your head. What's unique about your interpretation? That's something I'm still shaping. It's such a romantic story, and I really want the pain and agony of Odette giving into falling in love to come across. And then with my third act, I'm not only working on tricking Siegfried, but I want the audience to think, "Is that the same girl?" You're one of a handful of African American women who've been cast as Odette/Odile. What does that mean to you? When Paul Vasterling told me I'd be doing this role, I was absolutely ecstatic. It was more than just, Oh, I get to do this big role. It was, There have not been many before me who have done this. I consider myself a dancer and an artist first, but I have to embrace that I am kind of rarity when it comes to ballerinas. And to know that I'm at a place where I'm just me--there's no exception in terms of roles they see me in--is really comforting. I hope everyone leaves feeling like they went on a journey with me. That's all I could ask for--that what I bring to the stage is something people can relate to. I'm going to leave it all out there. Were there any dancers in particular you looked up to growing up? Lauren Anderson. 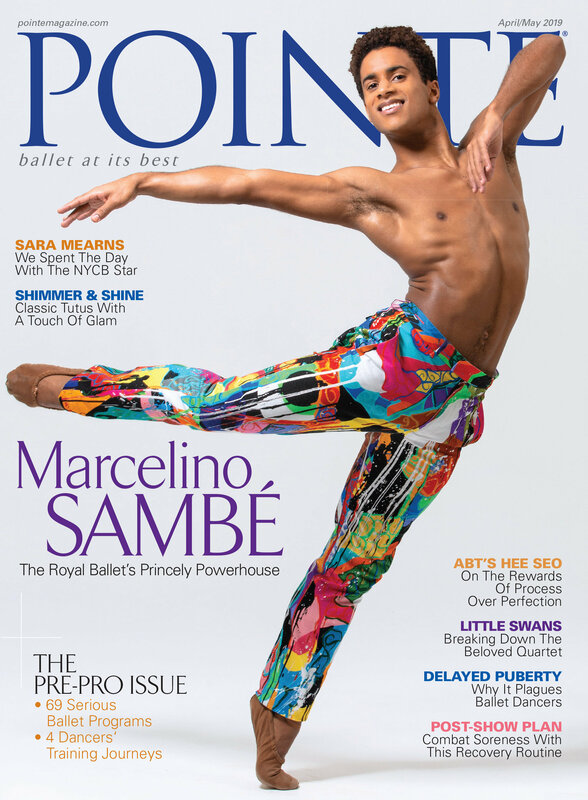 She was on the cover of Dance Magazine in the 90s wearing brown tights, and I remember thinking that was the first time I'd seen somebody who looks like me doing ballet. She was really a trailblazer, and seeing her on the cover of a magazine made me think that I could do this.